This item has been offered in a past event and was sold to the highest bidder for $49,000.00. However, due to the confirmation or partial settlement, the sale was cancelled and is now being re-offered at this event. 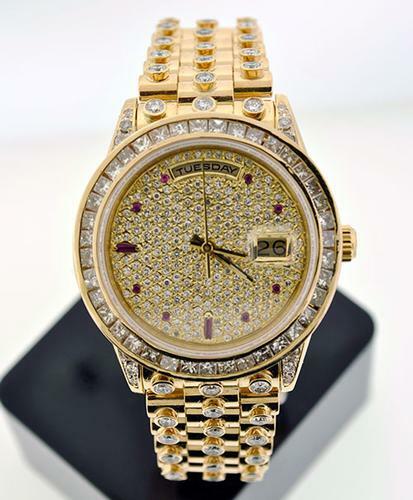 Showstopper 18K yellow gold Rolex Day-Date watch with a custom diamond and ruby dial. 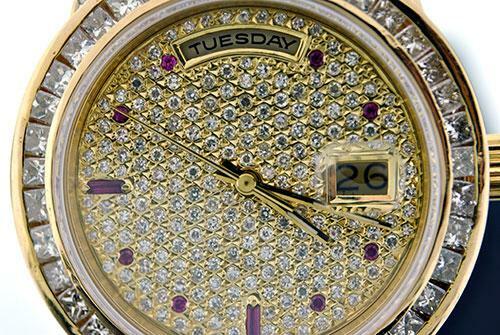 Pave set round diamond on the dial with ruby hour markers. Surrounded by a square cut diamond bezel. 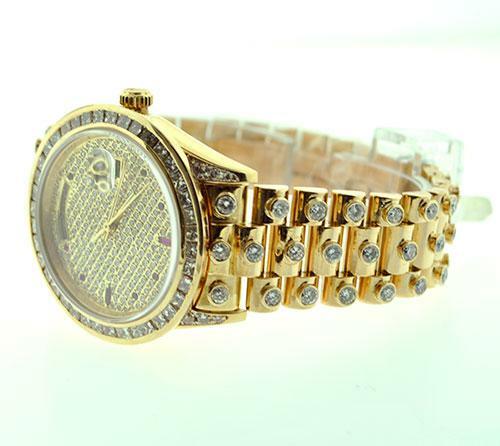 Watch lugs and 18k bracelet are also accented with diamonds throughout. 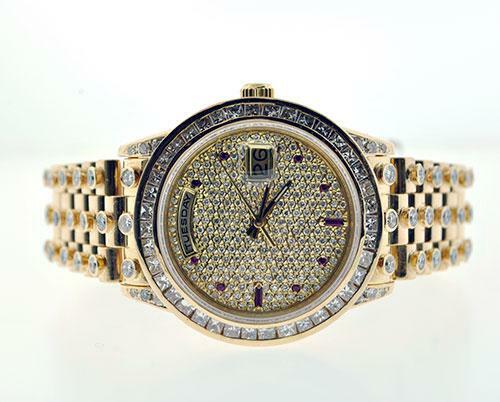 38mm case with bezel, Oyster Perpetual movement with day-date. Sapphire crystal. 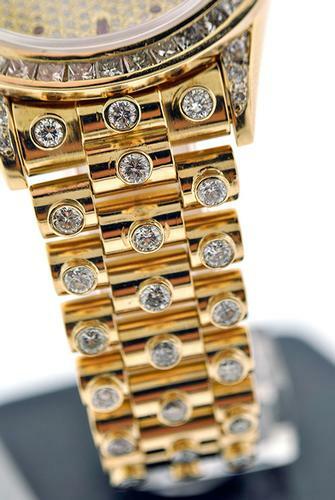 WATCHES: All Rolex watches are pre-owned. 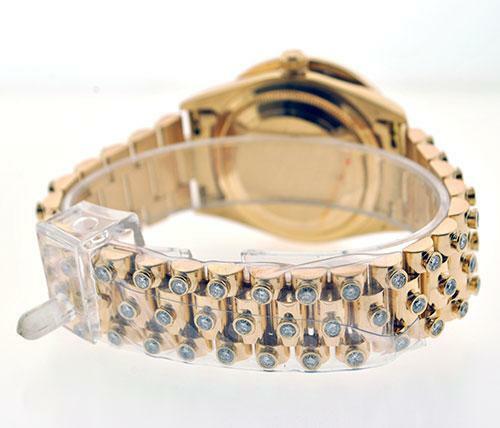 For this reason, Rolexes may have aftermarket parts, including dials, bezels, and bands. 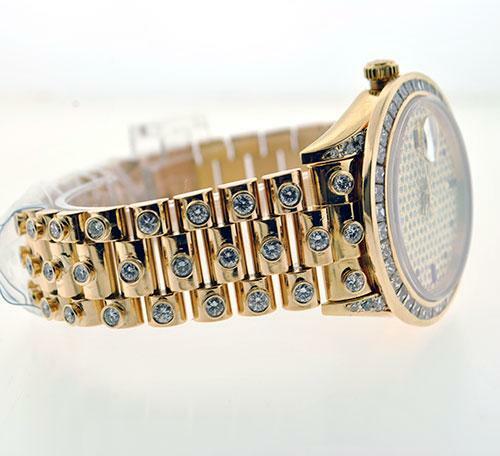 We do guarantee all the Rolexes are genuine. WIRE ONLY: Due to our contract with the agency for this lot, payment must be made via bank wire only within two business days of the auction closing. No other payment forms are accepted for this lot. DESCRIPTION NOTE: This item has been offered in a past event and was sold to the highest bidder for $49,000.00. However, due to the confirmation or partial settlement, the sale was cancelled and is now being re-offered at this event.